As 2016 begins, the recent public interest in hunting for royal burials shows no sign of abating. Hardly has the dust begun to settle on Richard III’s expensive new tomb in Leicester than work is starting on locating the resting place of another medieval monarch, Henry I (d. 1135), in Reading (like Richard III, Henry is also thought to be under a car park). Meanwhile, the Church of England is stoutly refusing to allow DNA tests to be carried out on bones thought to be those of the “princes in the Tower” who disappeared in 1483, and who may be buried in Westminster Abbey. With the honourable exception of Alfred the Great (d. 899), whose bones were – disappointingly for some – probably not found in recent Winchester excavations, this interest has tended to concentrate on the kings of England after 1066 at the expense of earlier kings, kings of British kingdoms other than England and queens. That is probably typical of the wider public consciousness of – and interest in – the Middle Ages, but it’s not exactly representative of the period. So here are five remarkable royal burials that present puzzles worthy of attention – and that might help add just a little bit of diversity, too. Oswald was a warlike leader of the northern kingdom of Northumbria, but adopted Christianity with all the zeal of the convert that he was. He so impressed the Irish missionary Aidan by his acts of charity that the latter seized his arm and exclaimed: “May this hand never perish!” Sure enough, it didn’t, remaining uncorrupted after Oswald’s death (or so the story goes). But it wasn’t just Oswald’s hand that had a remarkable fate. Oswald was killed on the battlefield by pagan Mercians and the Welsh, and his head and limbs put on stakes. Some of these remains were later taken to the monastery of Bardney in Lincolnshire. 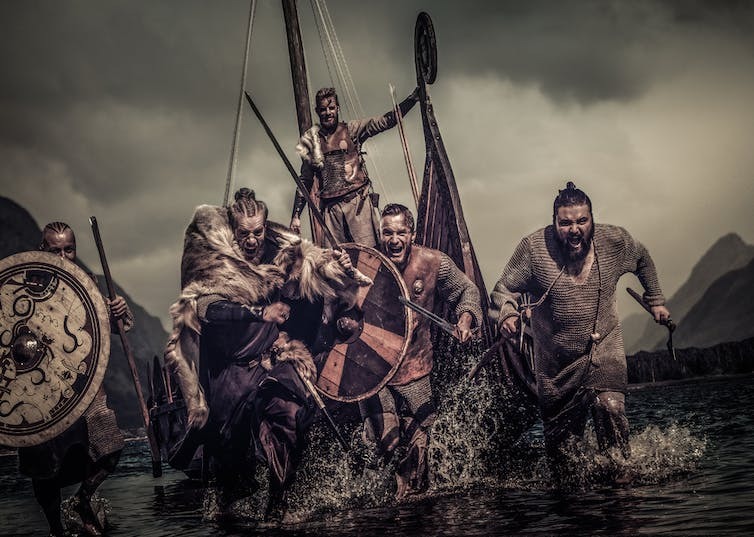 When this fell under Viking rule in the tenth century, the West Saxon royal family mounted a raid to steal the royal remains and bring them back to English-controlled land. What happened next isn’t entirely clear, but for the modern bone hunter the problem isn’t a lack of evidence – it’s too much of it. 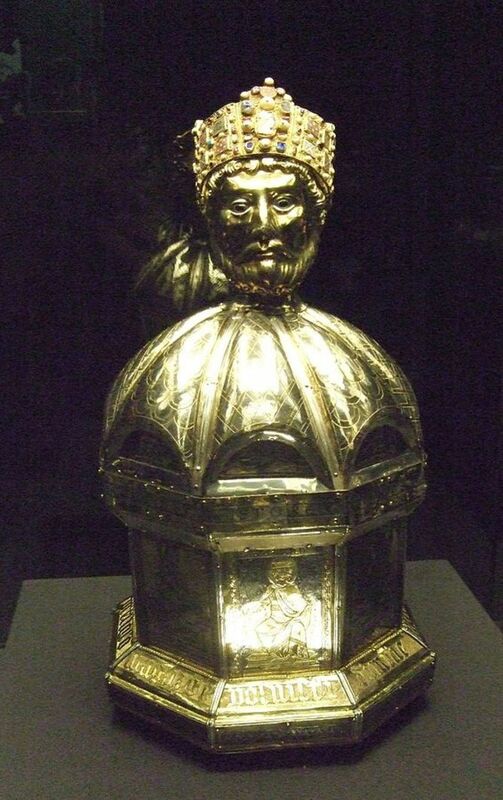 In the Middle Ages, five different establishments claimed to own Oswald’s head, from Durham in England through to Hildesheim in Germany, whose magnificent head reliquary survives to this day. Until Oswald’s bones are located, the oldest identified remains of any English – or British – royalty are those of a woman, Eadgyth, daughter of King Edward the Elder. And they’re not even in England. 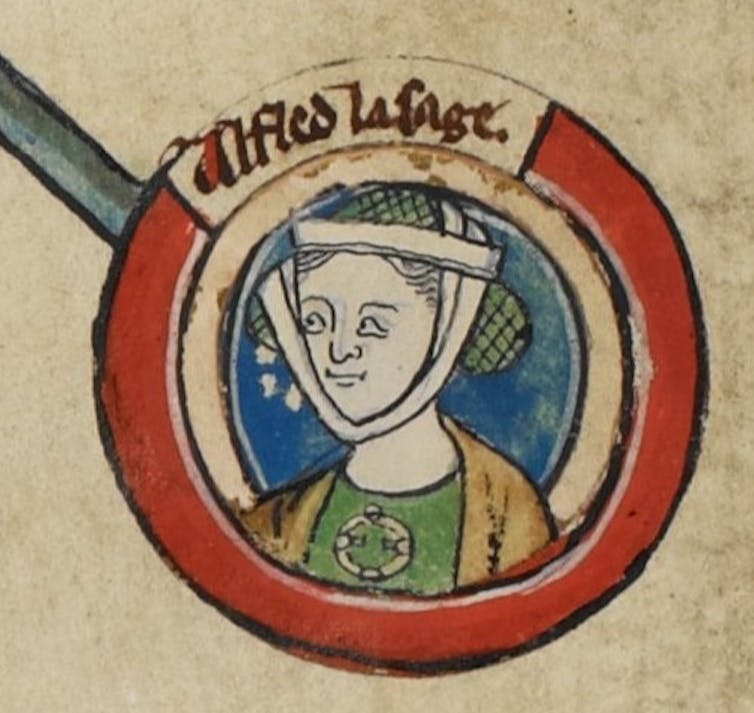 Eadgyth’s brother King Aethelstan sent her and her sister Eadgifu to Germany to allow Duke Otto of Saxony to take his pick of the two for marriage. Otto chose Eadgyth, and when he became emperor, she was anointed as his queen. She remained in Germany until her death in 946. 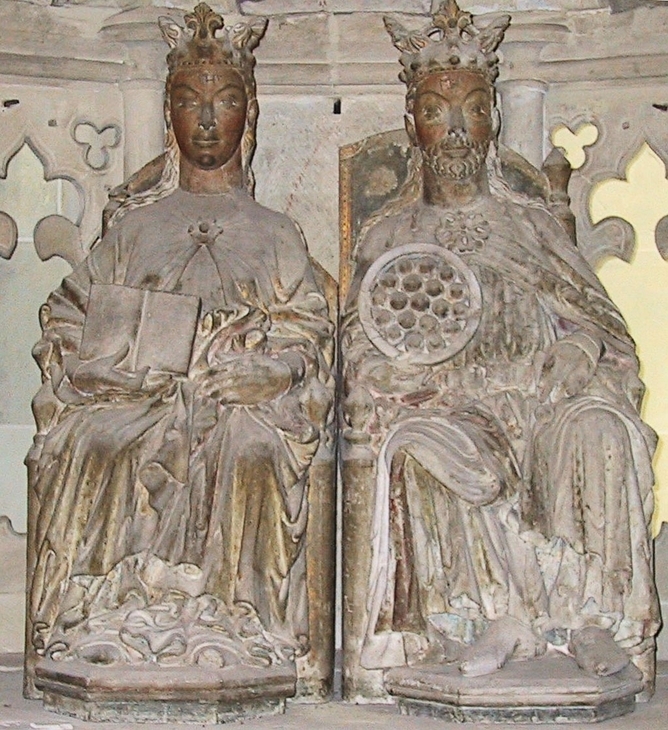 Eadgyth and her husband Otto I, Magdeburg Cathedral. In 2008 her tomb in Magdeburg in Germany was opened and, although carbon dating failed, isotopic tests confirmed that the remains were indeed Eadgyth’s. But what’s puzzling is that not all of Eadgyth was actually in the lead casket: her hands and feet were nowhere to be found and most of the skull was missing. What happened to these? Experts at the time of the exhumation suggested that thieves had struck in search of holy relics – but Eadgyth wasn’t generally considered a saint, so the mystery remains. Bayeux tapestry: the death of Harold. 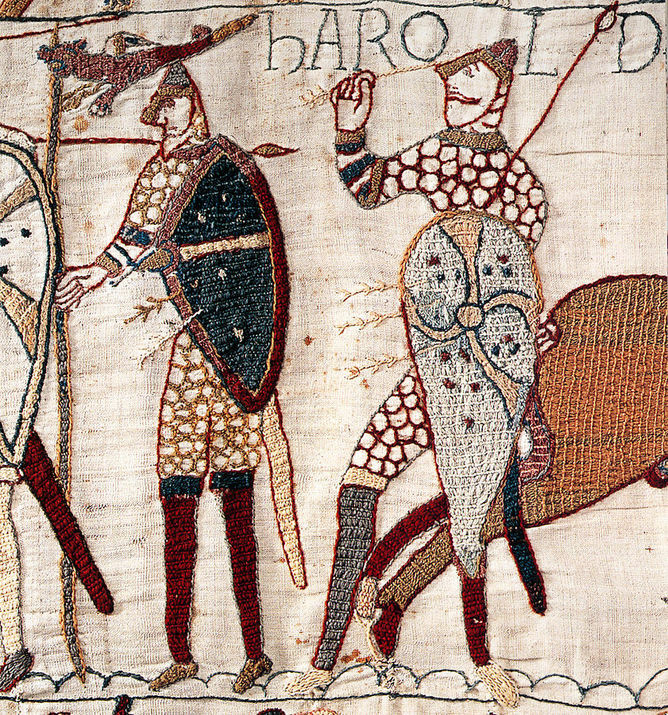 Everybody knows what happened to King Harold on the battlefield of Hastings in 1066 – but what happened afterwards? Confusion set in early. A contemporary text, The Song of the Battle of Hastings, says that he was buried on a cliff top; a later source claims he survived the battle and lived for many years as a hermit; but other texts – and most historians – suggest he was buried in Waltham Abbey, which he had endowed. Predictably, there is now much talk of finding his tomb. But even if the tomb could be found, could we be sure that it was really Harold inside it? According to the 12th-century Waltham chronicle, Harold’s face was injured beyond recognition by battlefield wounds – and the fallen king was identified for burial only by mysterious “secret marks” on his body known to his concubine, Edith Swanneck. Can we be quite sure that Edith could not have been mistaken? Margaret was another victim of the Norman conquest, but one whose life took a happier turn than Harold’s. Descended from King Alfred the Great, she was brought up in exile in Hungary before marrying the Scottish king Malcom III. She was treated as a saint soon after her death and her chapel can still be seen in Edinburgh castle. A gospel book she owned also survives in London. Shrine of St Margaret, Dunfermline Abbey. But what remains of Margaret herself is elsewhere. 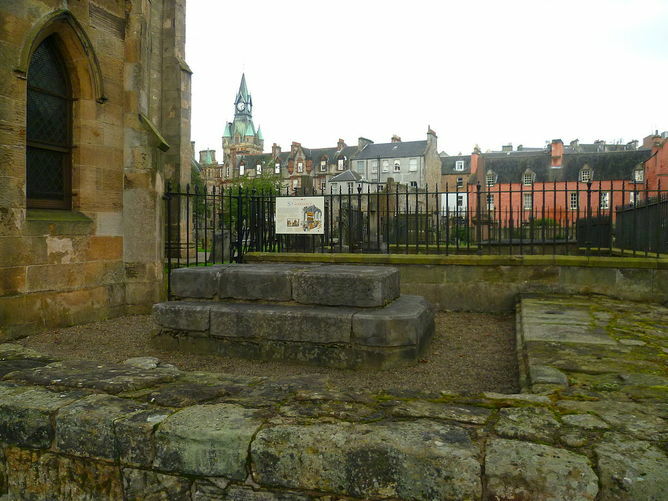 She was buried in Dunfermline Abbey on her death, but later her head was removed and taken to Edinburgh as a relic and in the confusion of the Reformation it ended up in France, where it was lost in the revolution. Other parts of Margaret’s body were transferred to Spain by Philip II. When Queen Victoria paid for the restoration of Margaret’s tomb in Dumferline, it was probably therefore the restoration of a cenotaph. However, in 1862, a Scottish Catholic bishop travelled to Spain to ask for the return of some of Margaret’s remains. He duly secured a relic, which he brought with him back to Edinburgh where it stayed for a century. In 2008, this relic – apparently part of Margaret’s shoulder – was ceremonially handed back to St Margaret’s church in Dunfermline. Llwelyn was the last leader of an independent Wales and met his fate resisting English imperialism in the shape of Edward I. Hardly had he been killed than his head was cut off and sent to London (though this was less grisly than the treatment meted out to Llwelyn’s former ally, the rebel baron Simon de Montfort, whose testicles were draped over his decapitated head). Llwelyn’s head was stuck on a pike at the Tower of London, where it remained for more than a decade to impress onlookers. What happened to the rest of Llwelyn isn’t certain. He was probably buried at Cwmhir Abbey in central Wales. But the archbishop of Canterbury at the time wasn’t entirely sure of this – and even wrote a letter to seek confirmation. 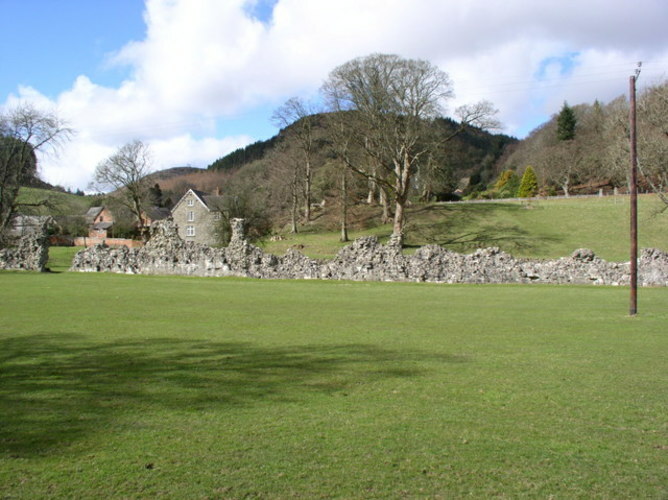 The abbey is now in ruins, but no archaeological excavations have taken place to certify the last resting place of (most of) the last independent Welsh ruler. Archeologists in Egypt have stumbled across the tomb of a previously unknown queen, believed to be the wife of a pharaoh who ruled 4,500 years ago, Egyptian officials announced Sunday. From inscriptions found on a wall of the tomb, the mystery queen has been identified as Khentakawess, wife of the Pharaoh Neferefre, Agence France-Presse reports. The tomb, which dates back to the middle of the Fifth Dynasty (2994 to 2345 B.C. ), was discovered by Czech archeologists in an Old Kingdom necropolis southwest of Cairo in Abu-Sir, and is part of Neferefre’s funeral complex. “This discovery will help us shed light on certain unknown aspects of the Fifth Dynasty, which along with the Fourth Dynasty, witnessed the construction of the first pyramids,” said Antiquities Minister Mamdouh al-Damaty. Also found inside the tomb were 30 utensils made of limestone and copper. Though reigning as king since the 11th December 1936, King George VI was not officially crowned until this day in 1937. His reign lasted until his death on the 6 February 1952, when he was succeeded by the current queen, Elizabeth II. George VI was crowned King of the United Kingdom and the Dominions of the British Commonwealth. He became king following his brother’s (Edward VIII) abdication in 1936. 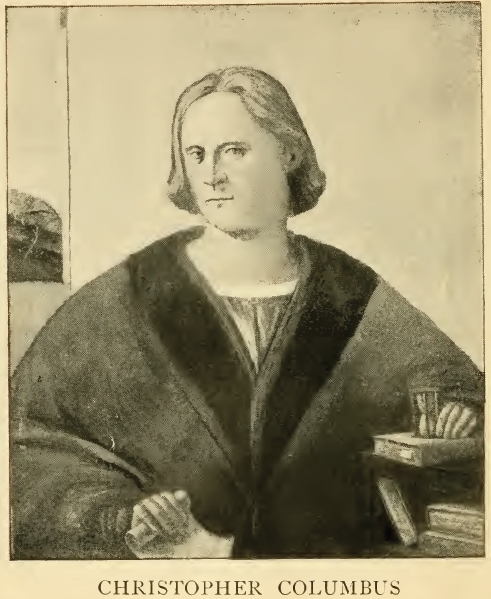 Christopher Columbus was born between the 22nd August and the 31st October 1451, in Genoa (now in Italy). Contrary to common belief Columbus did not discover America, but he did greatly increase European awareness of the New World. The maritime career of Christopher Columbus began when he was 10 years old. In the years that followed he undertook a number of journeys on the open sea in various roles on various ships. In 1485 he began looking for an opportunity to explore and discover a western route to Asia. He presented his ideas to the king of Portugal and was ultimately frustrated after several attempts. He also tried England, Genoa, Venice and then Spain (Castile) in 1486. He was frustrated in all these attempts (England eventually agreed, but by that time Columbus was already in league with Castile), but the king and queen of Castile (Ferdinand II and Isabella I) retained his services and after many attempts he finally gained the support of Ferdinand II and Isabella I on this day in 1492. In all, Columbus would make four voyages between Castile and America. His life would end in great disappointment, having been jailed and having the terms of his contract with Castile overturned due to various claims and convictions of abuse of power and mismanagement of the domains over which he governed in the New World. Columbus died on the 20th May 1506 in Valladolid, Crown of Castile (now in Spain).